Julie Forbes talks with the author of “Heal – The Vital Role of Dogs in the Search for Cancer Cures”. “Heal” explores how veterinarians and oncologists are working together to find new therapies for similar cancers in dogs and people. “Heal” also examines the emerging science behind some dogs’ remarkable ability to sniff out early stage tumors and the efforts underway to translate that talent into diagnostic devices for early detection of cancer. Enjoy this “Best Of” episode from the 300th episode celebration! So much to be thankful for. It has been a pleasure and an honor to talk with all the wonderful people in the dog world over the last several years. We look forward to 350 more! Enjoy this compilation of some of our favorite segments during some of Julie’s favorite interviews. You’ll hear Dr. Alexandra Horowitz, Dr. Patricia McConnell, Dr. Michael Fox, Dr. Marc Bekoff, and more! Host Julie Forbes starts the show with some announcements and updates, including an art event coming up hosted by AHELP Project for people who are grieving a lost pet. Then, what to expect from your vet. Julie talks with Dr. Erica Anderson of Jet City Animal Clinic about their practice and the importance of your veterinarian being open-minded and including you in the decision-making process. What makes a good vet “tick”? Dr. Jim Ha, one of this year’s SPARCS presenters! Julie Forbes and Dr. Ha talk about the genetic differences between dog breeds and how this impacts not only their behavior, but also how dogs of different breeds communicate with each other. Soooo interesting! Go to www.sparcsinitiative.org for more information on how you can watch/listen to the live stream of this fantastic conference – FREE! Host, Julie Forbes talks with a new trainer and gives her guidance on how to work with dogs. Julie and Shawna discuss all sorts of dog training and behavior topics such as different training tools for leash walking, praise and correction, the different “certifications” that are available for dog training and whether they actually prepare people to work with dogs, and much more! Important information for dog owners about dog training, from and interesting angle of conversation. Take notes! Julie Forbes invites a listener in the booth with her today for a live private dog training and behavior lesson for her fearful miniature australian shepherd. 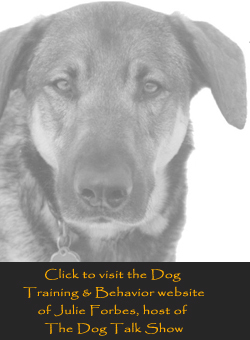 This show has lots of great dog training and behavior tips for fearful dogs and their humans. Enjoy! A listener in Utah wrote in to www.dogradioshow.com and asked dog training and behavior expert Julie Forbes for help with her elderly mother’s dogs who have a peculiar behavior that causes them to fight. Julie invited the listener to come on the show to talk for guidance. Enjoy this jam-packed episode and learn a ton about how to work with reactive dogs…using these two girls as an example. Are you prepared with your pets in mind if a natural disaster hits your home? Julie talks live with Tim Perciful, Firefighter and Pet First Aid Instructor about how to best prepare for disaster to set you and your family up for success – with a focus on four legged family members, of course! Also joined by HedzUPPets Watercollar Life Preserver – keeps your dog’s head above water…something a life jacket won’t do! Lots of great info on today’s show. Julie Forbes welcomes Dr. Michael Fox back on to show today. Dr. Fox has authored over 40 books and is the former VP of the Humane Society of the United States and the Humane Society International. One of Dr. Fox’s books “Not Fit for a Dog – The truth about manufactured dog and cat food” illuminates many aspects of the pet food industry that are important for pet owners to know about. One of those aspects is the relationship between veterinary schools and prescription diet companies. Why do most vets recommend we feed foods that have such low quality ingredients? Answer to this question and much more on today’s episode of The Dog Show with Julie Forbes. Can you fathom how sensitive your dog’s nose is? Can you imagine being able to sniff out cancer cells? Or detect when someone’s blood sugar drops, just by how it smells? Our dogs are noses with four legs, and one of the best ways to understand how they experience the world, is to understand their sense of smell. Did you also know that there is a canine unemployment epidemic in the U.S.? That’s right – your dog wants to work, and unless he’s lucky, probably doesn’t have much to think think about. The sport of K9 Nosework is one of the best ways to deepen your bond with your dog, provide him with a constructive outlet for his mental energy, and give him an opportunity to use his incredible sense of smell! Dog behavior and training expert, Julie Forbes, talks with professional scent detection training and handler, and Certified Nosework Instructor, Miriam Rose about the wonderful world of K9 Nosework. Just search for K9 Nosework in your area and get your dog enrolled today! It is one the best gifts you can give your dog! Dogs help kids learn to read and much more with Reading with Rover, a local non-profit that pairs great four-legged listeners with children struggling to learn to read. Julie talks with Becky Bishop all about this wonderful organization and how you can get involved! Next, Director of the Seattle Animal Shelter, Don Jordan, joins us for a discussion on what to do if you witness animal abuse. The short version? CONTACT THE AUTHORITIES. Take photos or videos if you can and speak up! Be the voice for those who have none! Dr. Jean Dodds joins Julie Forbes for a conversation about her newest book “Canine Nutrigenomics – The New Science of Feeding Your Dog for Optimum Health”. Today you’ll learn about the “genome” and “epigenome” and what they have to do with food! Can food impact the expression of your dog’s genes? The answer is a big “YES” and you’ll learn today how. Encore! Marc Bekoff, Ph.D., author of “The Emotional Lives of Animals”. Julie and Dr. Bekoff discuss the world of animals and emotions. Fascinating topic and man! “Good Dog, Happy Baby” author, Michael Wombacher talks with host, Julie Forbes about preparing your dog for the arrival of your baby. Then Julie talks with C.O.L.A. (Citizens for Off-Leash Areas) about the future of Seattle dog parks and the survey for Seattle dog owners to take. Julie comments on Cecil the lion, who was brutally killed by an American trophy hunter earlier this month. The public outcry is powerful, and appropriate. Next enjoy interviews with two dog-related authors: Spencer Quinn and then Jon Katz. Coping with the loss of a pet. A woman who’s dog suddenly and unexpectedly died last week shares her story along with Michelle Nichols, director of AHELP Project – supporting people and pets before, during and after the end of life process. See the home page for links to more resources about grief and also visit www.ahelpproject.org for more info about how they may be able to support you. Host and dog training and behavior expert Julie Forbes talks with colleague and mentor Tracy Ross about aggression in dogs. Very informative and interesting topic. Happy Pride! Children’s book author of the book “Rumplepimple”, then the president of Filson outdoor clothing talking about their dog products and first canine happy hour happening soon. Eclipse the bus-riding dog will be there! Dr. Jim Ha, one of this year’s SPARCS presenters! Julie Forbes and Dr. Ha talk about the genetic differences between dog breeds and how this impacts not only their behavior, but also how dogs of different breeds communicate with each other. Soooo interesting! SPARCS 2015 is this weekend, starting Friday June 19th. Go to www.sparcsinitiative.org for more information on how you can watch/listen to the live stream of this fantastic conference – FREE! Dr. Monique Udell, one of last year’s SPARCS presenters. SPARCS is an international conference in canine science! visit www.sparcsinitiative.org for more information on how to listen/watch live, for free! Dr. Patricia McConnell, author of “The Other End of the Leash” and expert in animal behavior. “When Your Dog Has Cancer” author Lola Ball. “Following Atticus” author Tom Ryan. Incredible story of how Tom and Atticus climbed all the peaks of the White Mountains over 4,000 feet, twice…. IN THE WINTER. Atticus is a miniature schnauzer! Awesome book. Enjoy this wonderful interview. Young Living Essential Oils independent distributor, Leah Espy. 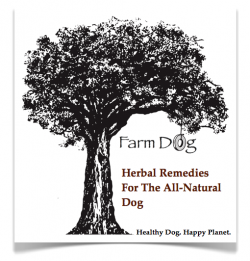 Learn about how essential oils work (it’s not just that they smell good), how they help the body and how you can use them with your pet. Also, why choose Young Living? It’s the brand that host, Julie Forbes uses in her home – find out why. Hear the remarkable story of recovery and healing of a little shih tzu named Picabo. Picabo was diagnosed with GME by specialists and given up to one year to live. Host, Julie Forbes met her some time ago and begged her owners to get in touch with Dr. Donna Kelleher, a brilliant holistic veterinarian. Nearly one year later, Picabo is fully recovered! Listen to this incredible story with one of Picabo’s moms and Dr. Donna Kelleher about her journey to recovery. Listen to Julie Forbes’ interview with Dr. Temple Grandin! Temple Grandin joined Julie Forbes for a conversation about how dogs experience emotion, how the family model is generally a more accurate description of their social structure than the alpha model, and so much more. It is – Temple Grandin – after all! Enjoy. Seattle Kennel Club Dog Show recap, Temple Grandin reflections (See Episode #314), Bold Lead Designs GORGEOUS leather collars, leashes and more and then Pawzii, a software platform that helps shelters organize pet license info. Jam-packed show today. Enjoy! The Seattle Kennel Club Dog Show is March 7th and 8th at Century Link Field Event Center! www.seattlekennelclub.org. So much going on at the show. Fun for the whole family. Listen to my conversation with Jane Anderson, Show Chair of the SKC Dog Show to hear all about the event coming up. Can’t wait! Be sure to stop by The Dog Show with Julie Forbes booth for some free snacks! Today The Dog Show with Julie Forbes celebrates six years on air! Enjoy a compilation of some of Julie’s favorite interviews over the years. Conversations with Patricia McConnell, Dr. Michael Fox, Marc Bekoff, Alexandra Horowitz, and more! Great conversation with Pawsitive Alliance today about how to effectively fight overpopulation of dogs. Their model for bringing rescues and shelters together for events is wonderful! Also tune in for some great coupon codes! Check the blog for links to discounts off of Pure Ayre, Pet Playgrounds and The Honest Kitchen.